Tuesday June 9- 1931 Wrote Hattie & Stella. Slept early in afternoon Later we went to the cemetery Fred Foster driving. They took his Mother then took a ride here at Woolfs for supper. Mr [Albers] brought us home Wednesday June 10- 1931 We left at 7.15 for Carlinville. Francis Fochler doing the driving. Mr Meister with us. The Synod meeting at Blackburn College. Had dinner then stopped in Springfield for The Girls to shop Reached home at 7. PM Dr Fochler drove us home from his house Thursday June 11- 1931 It rained some Laura up town Letter from Hattie I wrote LeGrand and The Rhinds. Slept awhile in PM Friday June 12- 1931 We were home all day. Edith had help to work in the yard. Lou Thomas here in afternoon I had a letter from Mrs Millers father Mr James Garden in Pennsylvania Saturday June 13- 1931 I was home all day I wrote Hattie & Emma Herriott Laura went up town in PM. 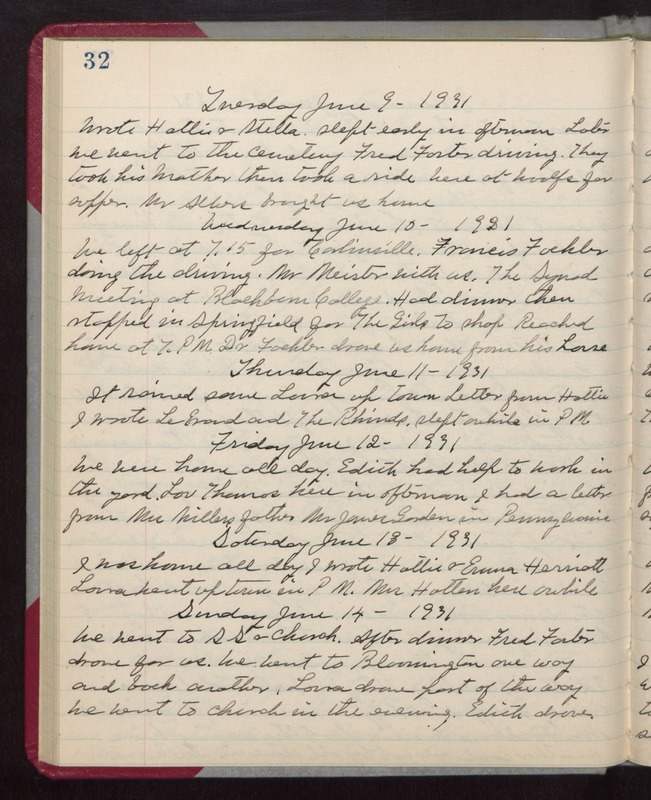 Mrs Hatten here awhile Sunday June 14- 1931 We went to SS & Church. After dinner Fred Foster drove for us. We went to Bloomington one way and back another. Laura drove part of the way We went to church in the evening. Edith drove.